1. The RNRU was founded in 1906 to administer the playing of rugby union in the Royal Navy. Its home is HMS TEMERAIRE and the Burnaby Road playing facilities in Portsmouth. 2. The RNRU is both a Constituent Body (CB) of the Rugby Football Union and an incorporated registered charity, both of which have a bearing on the governance structures and day to day management of the club. 3. The RNRU has 2 RFU Voting Clubs* - United Services Portsmouth and Devonport Services and there are 37 ships and establishments across the Navy who regularly play rugby and are registered with RFU as non-voting clubs. A further 11 teams**, playing less regularly are subsumed into umbrella clubs. The RN fields five representative teams: Senior XV, U23, Women, Veterans (colloquially known as the Mariners) and Sevens (colloquially known as the Sharks). 4. In addition a President’s XV is selected to play in specific tournaments or invitational matches, from season 17/18 a Women’s Development XV has stood up operating under the same premise as the Presidents, along with a Women Sevens side during the Summer months. The culmination of the season is the Inter-Services championship including the prestigious Army v Navy fixture held at Twickenham. Although the first of these matches took place in 1878, the fixture became annual and part of the Inter-Service (IS) Competition in 1907; this was expanded to include the Royal Air Force in 1920. The Navy has won the Inter-Services Championship 20 times. * Clubs playing in a formally recognised league ad granted specific voting rights within the RFU. ** 43 CDO, Armed Forces, EXCELLENT, RALEIGH, HM Sqn, NORTHWOOD, MCM Sqns 1 & 2, RM Poole, Ss 1 & 2. 1. The RNRU, as well as being part of the Royal Navy, is both a Constituent Body (CB) of the Rugby Football Union and a registered charity. It is therefore charged with the management, administration and development of the game of rugby union within the Royal Navy, in accordance with service regulations and traditions, as well as compliance with the requirements of the RFU and the regulatory framework for charities. The RNRU Management Structure has been reconfigured and is now better able to deliver the RNRU strategy and provide a broader effort on behalf of our multifarious stakeholders. 2. 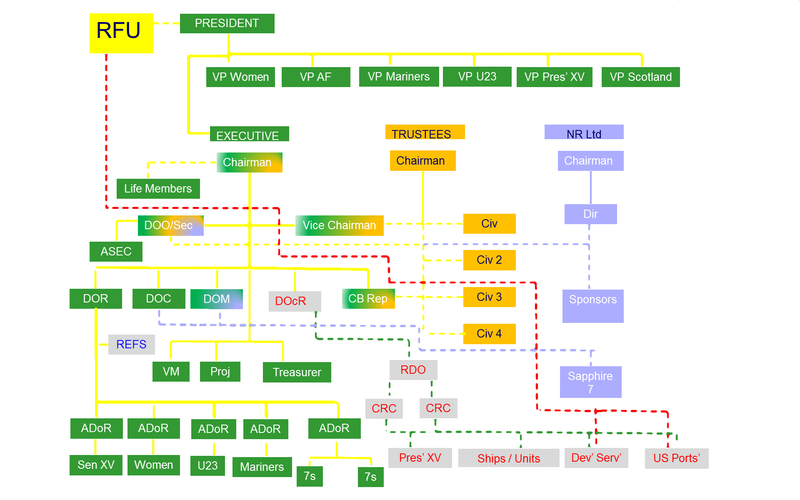 The RNRU Management Structure (Fig 1.1) consists of three primary bodies: a Board of Trustees, an Executive Committee and Navy Rugby Ltd Board of Directors, all supported by a cadre of Vice Presidents and non-executive volunteers. The Board of Trustees comprises eight trustees: a Chair of Trustees, four non-serving, independent members and three ex officio members of the Executive Committee, and therefore most likely serving members. The Board of Trustees should meet twice a year to maintain strategic direction for and oversight of the charity’s business as managed by the Executive Committee. The President and Secretary of the RNRU are not trustees, but are invited to participate in all meetings of the Board, in a non-voting capacity. The Executive Committee, comprising approximately 8-10 members, is responsible to the Board of Trustees for, and charged with, the day to day running of the RNRU and meets at least five times a year. The latest minutes are available upon request to Members. The RNRU Charity Articles of Association can be found at the hyperlink. 3. The RNRU Trust is regulated by Trust Deed No 249182 dated 18 March 1931, with a ‘Memorandum of Association of Royal Navy Rugby Union’ and registered as a Company Limited by Guarantee under The Companies Act 2006. Each subscriber to this Memorandum of Association agreed to become a Member of the Company. The current members of the company are available on application. Promoting amateur sport for the benefit of the public in particular by encouraging the participation of young people in the game of rugby football. The RNRU Charity does not currently deliver benevolence nor does it intend to within its strategy. In addition to the responsibilities and obligations listed at paragraphs 1 and 2 of this Business Operating Model, the following Bye laws identify the who, how, why, what, where and when of regulations, which underpin the ability of Royal Navy Rugby Union to operate within a legal and moral framework. 1.1. The RNRU is responsible to DACOS People Support for the proper application of the Service regulations relating to the administration of sport as they affect rugby union within the Royal Navy and Royal Marines. 1.2. The RNRU is comprised of all RN and RM Clubs in membership as listed in this RNRU Business Operating Model. Clubs are classified by the RFU as Voting and Non-Voting Members which are now referred to as Section 1 or Section 2 clubs respectively. 1.3. All clubs administered by the RNRU are bound by the Rules and Regulations of the RFU, the Laws of the Game and the IRB Regulations relating to the Game and that any breach thereof shall be a breach of the Rules of the RNRU and shall be dealt with under the powers contained in its rules in accordance with powers which have been delegated to it by the RFU. 1.4. All RNRU clubs are entitled to be represented at any AGM or SGM of the RNRU and cast one vote each on any motion. If they are unable to attend, the RNRU will act as nominated proxy and vote on their behalf. 1.5. There is no subscription for membership of the RNRU, and the RNRU shall pay any annual subscription required by the RFU for affiliation on behalf of its clubs in membership. 2.1. The RNRU Board of Trustees shall comprise of no less than 7 trustees, including a Chair of Trustees. The Chair of Trustees and four of the other trustees to be independent (ie independent of the naval Service – non-serving personnel): the final three trustees to be ex offico members of the Executive (and therefore, most likely, serving personnel), namely the Chair of the Executive Committee, the Vice-Chair and the RFU Council Member. All nominations for trustees (with the exception of those ex officio members of the Executive Committee) are to be agreed (majority vote) by the Board of Trustees. The Board will meet at least twice per year, plus whenever required, in order to maintain strategic direction for, and oversight of, the charity’s business as managed by the Executive Committee. The President of the RNRU is not a trustee, but is to be invited to participate in all meetings of the Board, in a non-voting capacity. The Secretary of the RNRU is not a trustee, but is to participate in all meetings of the Board, in a non-voting capacity. A number of Trustees also make up a separate scrutiny body called the Independent Finance and Approvals Committee (IFAC). The IFAC are charged with maintaining oversight of the overall financial health of the RNRU, approving budgets and preparing audits. 2.2. Established in September 2016, as a wholly owned subsidiary of the charity, NRL is a VAT registered company (a company limited by shares registered in England and Wales) Company Number: 10259113. ), with three directors: a member of the Executive Committee; a Trustee and an independent Chair. The RNRU Company Secretary also performs the same duties for NRL. NRL has a separate bank account and operates as a separate entity in financial terms from the RNRU. It was established with a £100,000 share issue from which all trading activity is resourced. All operating profits are donated to the RNRU as its principal form of income generation. The RNRU Trustees retain oversight of Trading Fund activity by including the Managing Director as a member of the IFAC and by inviting the Chair to attend and report to the Trustee Board. Navy Rugby Limited convenes Director's meetings at least bi-annually to ensure the proper conduct of trading activity. As a result of the establishment of NRL, the RNRU de-registered for VAT and all trading activity now flows through NRL. Chair, Vice Chair, Director of Operations (Chief of Staff and Company Secretary), RFU Council Member, Director of Rugby, Director of Marketing, Director of Communications, Director of Community Rugby, Volunteers Manager, Treasurer and Projects Officer; the latter three are non-voting members. Individuals may hold more than one of these posts at a time, up to a maximum of two posts per individual, and provided that the number of Executive Committee members does not reduce below five). 2.4. The Executive Committee may co-opt other members as and when required. Co-opted members of the Executive Committee shall not be full members, and as such, will have no voting privileges. 2.5. If a casual vacancy shall arise in any position on the RNRU Board or Executive Committee, such vacancy may only be filled by the Executive Committee in its discretion and any person so appointed shall hold the office until the next Annual General Meeting. 2.6. The Executive Committee shall meet formally at least 5 times per year. A quorum for a meeting is the Chair or Vice Chair plus three other voting members. The meeting agenda will be promulgated two weeks before any meeting. Members who are unable to attend are to nominate a representative from their sub committees to attend, empowered with the authority to vote on their behalf. 3.2. Members of the Executive Committee or others nominated by a member of the Executive Committee shall chair Sub Committees and every member of those Sub Committees will be Officers of the RNRU in their own right. Appointments of personnel to serve on Sub Committees shall be the made by the relevant committee chairman. 3.3. Expenses may be claimed from public funds, chargeable to local budgets, by members attending Executive Committee meetings and Sub Committee meetings. 4.1. An Annual General Meeting (AGM) shall be held each year, not later than December 31, usually on the same day and venue as the RNRU Clubs’ Conference. A minimum notice of twelve weeks will be given for the date of an AGM. Clubs may send as many representatives as they wish to an AGM but each club shall only be entitled to one vote on any issue. A quorum for an AGM is fifteen clubs, and at least four members of the Executive Committee (including the Chair). The President shall normally chair the AGM but may delegate this function to the Chair. Debate and vote on any motions relating to the administration of the RNRU. 4.3. Nominations from clubs for appointments to the Executive Committee must be forwarded to the Secretary RNRU by no later than 1 April each year, or as called for by the Executive Committee as part of succession planning. Those nominations will be considered by the RNRU Management Board who will make recommendations to the Executive Committee and AGM. Where there is more than one nomination for any post, the RNRU Board will indicate their preference and the Executive Committee shall select one of those candidates by secret ballot as their preferred nomination. All nominations will be put before the AGM. 4.4. Motions proposing changes to the RNRU bye laws shall be forwarded to the Secretary of the RNRU by no later than 6 weeks before the date of the AGM. Such proposals must have the support of two clubs and will be passed at the AGM provided that there is a two-thirds majority in favour. 4.5. Special General Meetings (SGM) may be called at any time to discuss the business of the RNRU provided a written request is made to the Secretary RNRU containing the signatures of at least 15 clubs, or as specified above following an AGM. The Secretary is to convene an SGM not earlier than 8 weeks and not later than 12 weeks from the date of receipt of a written request or vote at an AGM. invitations to dinners and social functions at the discretion of the Executive Committee. Written nominations have been circulated to all members of the Executive Committee not less than 5 working days before the meeting. 4.8. There is no limit to the number of Life Members that may be elected at any one time, or in any one year, but numbers of Life Members will not normally exceed 50. The names of all unsuccessful nominations, the reasoning of the Executive Committee for their non-election, and details of the time-bar that applies to that individual. 5.0. Whilst there is no formal commitment or expectation placed on Life Members, it is hoped that, where appropriate and feasible, they will act as an ambassador for RN rugby, providing constructive support and assistance, in particular making the connection from past to present and thus safeguarding the legacy of the RNRU. 6.1. The RNRU Board may from time to time invite the outgoing President to fill the post of Immediate Past President. This post would not normally be filled when the President has accepted Life Membership of the RNRU. 6.2. The RNRU Board may from time to time, invite senior officers to become Vice Presidents who, by virtue of their appointment are able to provide assistance and support to the RNRU or who have given outstanding support and service but are not yet in a position to be elected as Life Members. 7.1. The RNRU aims to encourage, and where possible, assist players to reach their full playing, coaching or refereeing potential. 7.2. All members of the RNRU shall recognise the priority of claim on players laid down in the RN/RM Sports Board Section of BR51, Vol 4 - Sport in the Royal Navy. Where there is a fixture clash, no member shall thus play for any civilian club if selected for a representative RN team without the express permission of the Chair RNRU. 7.3. Personnel of other Navies of the Commonwealth are eligible to play for the Royal Navy when they are attached for duty to the Royal Navy for a period of at least six months, or in accordance with BR51, Vol 4 - Sport in the Royal Navy. 7.4. A cap shall be awarded to each player who represents the senior Royal Navy XV against the Army, the Royal Air Force or the French Navy on the first occasion of his playing. With effect from Season 17/18, Caps for RNRU (W) representation are aligned as for the Senior Royal Navy XV; that is a cap shall be awarded to each RNRU (W) player who represents the RNRU (W) against the Army, the Royal Air Force or the French Navy on the first occasion of her playing*. The cap shall be of dark blue velvet trimmed with silver and having a naval crown and wreath on the front. 7.4.1. All capped players are entitled to wear a ‘silver’ navy tie, which shall be dark blue background with silver device consisting of the Royal Crown surmounting the monogram interwoven at intervals upon it. This will be gifted by the RNRU. All other players, committee and supporters may purchase the ‘gold’ tie. Complimentary tickets shall be provided for Inter Service matches at the discretion of the Executive Committee. 8.1. A Budget will be set each year for each for both the RNRU and NRL that collectively is balanced. The management of this budget will reside with the Treasurer who can instigate immediate controls where bad management or potential overspends are in evidence. 8.2. Executive Committee Directors are delegated individual budgets that they have sole responsibility for the correct, fair and legal spend of charity money. Proper Governance of these budgets must therefore be their responsibility alone and each Director is to maintain control and understanding at all times. 8.3. The requirements to plan a budget and expend that budget in line with the financial policy, rules and delegations cannot be over-stated. Poor behaviour will result in immediate withdrawal of delegation authority and could leave personnel liable for any contracts or expenditure that they enter into. 8.4. No budget expense shall be undertaken by any RNRU member until financial delegation is presented to them formally by the Treasurer. Each Director or delegated budget holder will be required to sign these financial rules before they are permitted to enter into any contractual agreement on behalf of the RNRU or NRL. 9.1. Budgets amounts are relevant to each line of accounting code / resource line and are a maximum that may be spent in total. 9.2. Budgets may not be flexed across accounting codes without prior agreement of the Executive Committee. Any such requirement must be presented by the relevant Director with an explanation in advance of the change required. 9.3. Budgets will have additional restrictions once 80% is spend in order that the maximum permitted spend levels are not breached. At the 80% level, the Director of that Budget must be informed by any delegated accountee and then all further spend against this budget must be authorised by the Director beforehand. No overspend is allowed under any circumstance without prior written agreement of the Executive Committee. 9.4. It remains the responsibility of the Director and any delegated member to ensure that correct budget codes are used when expenses and receipts are being authorised. 9.5. The Treasurer is permitted to freeze a budget line or remove remaining budget lines once the activity that budget refers to is complete. 9.6. As a Charity, all expenses must be auditable and accountable. All spend must be entered onto Concur with the relevant coding, official receipts and a full explanation. Failure to complete these simple tasks can mean the payment being refused and the expense invalidated. 10.1. Budgets are allocated to Directors of the Executive Committee. They are solely responsible for all spend under their area of responsibility. 10.2. Delegations to other RNRU member as Budget Holders is authorised but overall responsibility remains with the Executive Director. 10.3. Budget Holders must sign these Financial instructions stating that they understand these rules and their responsibilities and personal liability should they breach the rules. 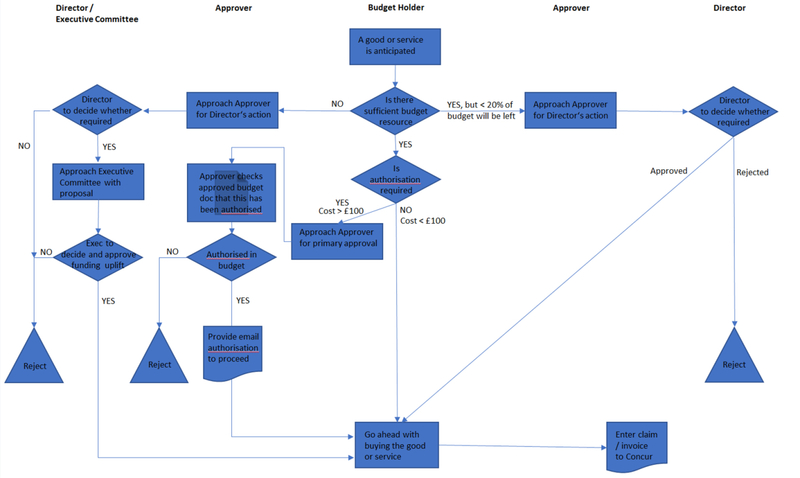 Spend of the budget does not need authorisation below £100 (this figure can be adjusted by each Director for each of their delegated Budget Holders) on an individual spend. All indented spend above this limit must be authorised first by their Director or Assistant Director. A Flow Diagram at Fig 1.2.explains when additional authorisation is required. Budget Holders are to keep their own records of what budget funds are being spent. They are to review the RNRMC prepared Budget Report monthly and check that spend remains within the limits set. The Director is to be warned when the spend is approaching 75% so that appropriate checks can be applied. 11.1. The new budget process will start each year straight after the AvN match. Each Director will be asked to produce a draft budget in the month following the AvN match. These collectively will be reviewed in line with goals and objectives of the RNRU. This process will require a half day meeting for the Executive Directors where they will present their areas of responsibility and explain any cost growth and new requirements. Collectively adjustments will be agreed and a collective position reached that balances expected income and expenditure. Jun Executive Meeting to finalise the draft Budget and discuss what should go into the Budget Report for the IFAC and Trustees. Budget levels and delegations issued. 12.1. The RFU has delegated powers to the RNRU to hold enquiries and award punishment, or take other such action as is seen fit (subject to a right of appeal to the RFU) with respect to disciplinary incidents relating to RNRU clubs and members. This authority is exercised by the RNRU Disciplinary Sub Committee under a Chairman who shall act as the RNRU Disciplinary Officer. The Secretary RNRU will be the Disciplinary Secretary for the RNRU. They are responsible for giving advice to RNRU Clubs on discipline policy and casework. 12.2. The Disciplinary Sub Committee will act in accordance with the Instructions for the guidance and assistance of Disciplinary Committees on the Procedure and Conduct of Disciplinary Hearings as laid down in the RFU Handbook. 12.3 Every club of the RNRU shall appoint a Disciplinary Committee charged with the responsibility of maintaining high standards of discipline within the club. Club Disciplinary Committees are to take action within 48 hours of any player being sent off or cited, and are to report such action to the Secretary RNRU. 13.1. The RNRU employs five pensionable staff on a regular basis and funded by the charity: an Assistant Secretary and Account Officer who manages the Rugby Office at HMS TEMERAIRE and a Rugby Development Officer (RDO), part funded by the RFU, and two Community Rugby Coaches (CRCs), who are focussed primarily on grass roots rugby development in accordance with the RNRU strategy. All vacancies within the RNRU are advertised widely, inviting volunteers, both serving and civilian, to be considered for selection. Executive appointments and bye-law changes are agreed at the RNRU AGM, where all member clubs are entitled to vote. 13.2. Information will be updated as these bye laws are drafted and ratified at the Annual Meeting for Member Clubs. 14.1. Managed by the Assistant Secretary, the Patrons are list, c350 - strong, of RNRU supporters who pay a monthly subscription. A valuable income stream to the RNRU, it also allows our supporters a unique patrons tie and access to a ballot for an allocation of tickets for matches at Twickenham, international tickets, premiership season tickets, 6 monthly prize draw and priority Army Navy ticket purchases. 15.0. RNRU does not own any land or structural liabilities but rather takes advantage of the general sporting facilities made available to the Royal Navy and general military units as members of the Armed Forces. 15.1. In order to generate income the RNRU has a number of sponsors that provide financial support as well as services in kind. All sponsorship deals are guided by the RNRU Sponsorship Strategy 2015-2020. The underlying tenet of any sponsorship deal is to achieve not just quantity in terms of the value of a donation but loyalty, leverage and longevity**. New sponsors are measured against these criteria and existing sponsors are encouraged to move up the compatibility scale against these measures. There are broadly 3 tiers of sponsors; with Tier 1 sponsors providing the most support and Tier 2 and 3 providing commensurately less. 15.2. In return for donations ‘sponsors events’ are held throughout the playing season to ensure the relationship with sponsors is not merely one-way but builds a strong partnership between the sponsor and the Union. In creating a strong two-way commitment this binds the relationship and thereby optimizes its longevity. Longevity is key to all sponsor negotiations, as stability of income is a fundamental requirement to be able to sustain development within our 5 year plan. Sponsors' event run throughout the year and include: The President's Supper, the RNRU Annual Cocktail Party onboard a warship, a box at the Mountbatten Festival of Music, the RNRU Golf Day, the RNRU Annual Dinner, as well as hosting at home games and the Army Navy fixture at Twickenham. In addition we invite sponsors to join us at Twickenham for some of England’s home games in the Autumn internationals and the Six Nations. 15.3. Our current sponsors are ESS, Babcock, Rolls-Royce, Thales, QinetiQ, BMT, MBDA, Saab, Peter Cooper Volkswagen, Agrekko, Multi-National Logistics Services, and SA Group. Their logos can be seen on our representative and inter-command playing kits and at the bottom of the home page on our website. The total cash value of sponsorship is in excess of £150,000 for season 2017/18 and increases to over £200,000 when services in kind are added. 15.4. All contracts entered into by the Union or its subsidiary with a value of over £50,000 per annum or with a duration greater than 3 years must be approved by the Trustee Board. The Union currently has two contracts that fall into this category. Sapphire 7 Ltd. This business consultancy contract provides: Marketing, Website and Webshop management, Event management (e.g. Army v. Navy, Annual Dinner), Social Media facilitation, Communications Support, Team Kit Supplier Management and Brand Management. This is a five year contract running from 2016-2020. Ninety9 Ltd trading as Under Armour Teamwear UK and Ireland. This is our kit supplier and provides a full range of UA Team Wear for our representative teams. The current contract was due to expire in 2019 but will now be terminated in 2018 and a new kit supply contract is currently being investigated. 15.5. The RNRU also has a contract with the Royal Navy and Royal Marines Charity to provide all our financial services. This contract is a continuous contract but is below the threshold that requires Trustee approval and can be terminated at six months' notice. The production of regular news articles for the website covering the full remit of RNRU business including match reports, preview articles, from both the representative and community areas, news items including change of personnel, personal interest articles, adverts for new volunteers, including member clubs, ships and units. Live twitter coverage at matches. Co-ordination of information for the production of Marine Nationale, RAF and Army match day programmes between team managers and designers/printers. Production of Annual Dinner and Ball Programme/Year Book. Supply of articles to Navy News and other media outlets including RN publications, RFU and local media, particularly media networks across South West and South East, continuing to build on the back of Marine Nationale Match and RNRU 7s and BT Sport exposure. The facilitation of BFBS coverage of matches at Burnaby Road and Marine Nationale and IS matches. Dealing with questions from the public and veterans about family members involved with the RNRU. 17.1. Representative Rugby. A structured season is developed annually to maximise player availability for the representative sides and allow players to progress along the player pathway from entry level in their ship/unit to representative rugby. The 12 month cycle starts with the Sharks playing during the summer term, inter-unit/ship (eg. RM Argyle Bowl, Navy Cup), inter-command competitions and U23 IS competition take place between Sep and Dec, which feeds the Senior XV, who run an annual training camp (Feb-May), Women and the Mariners who play between Jan and May. The Royal Navy contribute routinely to the Combined Services (CS), now called ‘UK Armed Forces’ (UKAF) at all levels. 17.2. Aside from the IS matches the Senior XV play another high-profile annual fixture against the French Navy (Marine Nationale). The Senior XV also competes in the International Defence Forces World Cup every 4 years and the Commonwealth Navies Cup, a competition contested every 3 years between the Navies from Australia, New Zealand and South Africa and UK, although in recent years the US Marine Corps have been invited into the fold. These provide the fixed waypoints around which the RNRU proposes a RNRU 5 Year Touring Plan, with the aim of providing each representative and if possible command side the opportunity to tour once every 2-3 years. 17.3. Community Rugby is the responsibility of the Director of Community Rugby, supported by the RDO and two CRCs, who are each programmed to conduct 20 hours of community rugby work each week within RN establishments. Through the Rugby Development Committee and the network of RNRU volunteers, the aim is to develop the club management structures in all ships/establishments, grow the game at grass roots level and recruit and develop players, coaches, referees and volunteers. 17.4. Current structure includes: grass roots rugby development (O2 Touch etc), inter ship/establishment fixtures, Eastern and Western Region leagues, 7s and 10s competitions, the Navy Cup and inter-command competition where the RN East, RN West, RN North, RM and Fleet Air Arm compete annually for the Inverdale Cup***. 17.5. President’s XV. The purpose of the RNRU President’s XV is to bridge the gap between community and representative rugby; it is classified as a community output and thus responsibility resides with the Director of Community Rugby. It provides an opportunity for regional players who have displayed a talent for rugby and the potential to break into the representative area, but have not been selected for the Senior XV IS training camp. These players need to be playing at a level of rugby equal to or above that required to be selected for their regional teams. This process allows for their continued development, which aligns with the RFU player pathway model for the improved community players to be monitored, with the potential of being better placed for selection in the following year’s representative sides. In essence there are two groups of players: the Senior XV IS squad and a top-end community development squad; cross-over between the squads will inevitable occur, although this should be minimised to allow for the development of a larger pool of players across the RNRU. 17.6. Women’s Development Squad. Similar to the Men’s President’s XV, the Women’s Development Squad has been introduced to provide opportunities for those women who have been identified as having the potential to play rugby at a higher level. Although there is no Regional competition for women, as yet, the Development Squad has a programme of fixtures against suitable local clubs in order to generate a pathway into the senior Women’s team. 17.7. Coaches. The RNRU is committed to enhancing the development and ability of coaches of all levels within the Royal Navy. Within a formal structure we aim to provide effective coaches for all Representative, Regional and Establishment/Unit teams. Our coaches are the key to the re-generation and development of Navy Rugby. 17.6. Developing coaches is seen as a key strategic aim of Navy Rugby to ensure the future health and vitality of the Union both in terms of quality and quantity of players. There is a wealth of coaching resource available to coaches some of which can be provided through the RNRU. 17.7. Coaching and Continuous Personal Development (CPD) courses are available to all serving personnel via the England Rugby online course booking system, accessible through the link on the front page of the RNRU website..
18.1. The Royal Navy Rugby Union Referees’ Society (RNRURS) is an integral part of the Royal Navy Rugby Union and also of the UK Armed Forces Rugby Referees Federation. It exists to foster the development of match officials in the Royal Navy and provide them opportunities to develop and realise their full potential. To facilitate this, the RNRURS works closely with the UKAFRR to ensure that all policy matters are able to be benefited by its members be they sea, shore or overseas based. The RNRURS provides Area Secretaries based in Portsmouth, Plymouth and Faslane commensurate with the RNRU Eastern, Western and Northern region structure. The primary objective of the Area Secretaries together with the Senior Appointer (for the more senior appointments pan UK) is to appoint the right referees to the right games. However the RNRURS Training and Development Officer keeps a watching brief over all members to ensure that their development is not neglected. 18.2. It provides refereeing support to all of the RN representative sides and any club site that may wish to utilise the services of a referee in the training / coaching environment. In conjunction with the RNRU's Rugby Development Officer and Director of Rugby, the Society ensures that all coaching courses, all development initiatives and all training for Naval Physical Training Instructors receive a refereeing input. The Society is also indebted to the support provided by the RNRU and its committee, the RFU through its refereeing department and of course its sponsor QinetiQ. Choice - Volunteering must be a choice freely made by each individual. Any encouragement to become involved in volunteering should not result in any form of coercion or compulsion. Freedom to volunteer implies freedom not to become involved. Diversity - Volunteering should be open to all no matter what their background age, race, sexual orientation, faith, etc. Reciprocity - Volunteers offer their contribution unwaged but should benefit in other ways in return for their contribution to the game. Benefits that volunteers expect to gain include: a sense of worthwhile achievement, useful skills, experience and contacts, sociability, fun and inclusion in the life of the organisation. Recognition - Explicit recognition of the value of what volunteers contribute. Make visible the contribution of volunteers, e.g. in media such as the RNRU website, Navy News and the Annual Report. Identify how volunteers contribute to the game, including the number of volunteers involved, the time they give and the roles they undertake. Involve volunteers, using consultation and feedback, when developing new policies and ideas. Communicate with volunteers about issues which directly affect them. Ensure that all relevant proposed regulations, guidance and practice are checked for impact on volunteer activity and funding before being adopted. Reduce the tasks required of volunteer administrators by undertaking an active review of all information that volunteers are required to provide. Be inclusive by working proactively to recognise and remove or limit the barriers to volunteering. 19.3. The Volunteer Strategy (issued separately) contains specific details on the levels of awards and eligibility. * There will be no back dating of Caps awarded as voted at the Exec Meeting Jan 17. ** Loyalty – how long have they been with us? Leverage – how connected to the RN are they? Longevity – can we agree 3-5 year contracts rather than an annual negotiation?